Click here for audio of Episode 607. Today, high technology in AD 1200. The University of Houston's College of Engineering presents this series about the machines that make our civilization run, and the people whose ingenuity created them. The year is 1198. The place is Monkton, England -- a town on an island off the coast of Kent. It isn't far from Canterbury Cathedral, where Thomas à Becket was murdered 28 years before. English monks have a monastery there. They've set up a water wheel to grind grain. Now hi-tech comes to Kent. Windmills were the new power source. They'd appeared about 20 years before. They outperformed water wheels. Now they were sprouting everywhere. A man named William Wade got into the act. He built a windmill near the monastery. The problem was, he built on land his uncle had sold to the monastery back in Becket's time. Wade had always disputed the sale. He figured the land was still his. The monastery had been slipping. It'd once had 140 monks. Now there were fewer than 100. When the windmill went in next door the monks were furious. They were far more angry about the competitive technology than they were about encroachment on their land. So they took William to court. By now, the Norman administration had created legal logjams that rival the ones we see today. First the monks went to the local manorial court. Then the case got bumped up to the Royal Court. The Royal Court found against William. They ordered him to tear down his mill. About this time King Richard was assasinated. So William crossed the English Channel and went to King John in Normandy. He offered the King ten marks to confirm his right to operate the mill. This was a small potatoes transaction, and the King said, "OK."
The monks were patient. They opened another suit charging that William had deceived King John. He hadn't mentioned the judgment pending against him. By the year 1203, a priory court in Canterbury found against William again. This time he agreed to tear down his mill and return the land to the monks. But he didn't do it. By the year 1205, the case was back in King John's court. And there William finally lost his case -- and his windmill -- after six long years of litigation. Of course, not long after all this foofaraw the Monkton monks themselves began building windmills. In fact, while the fuss was going on, a group of nuns near Canterbury had already begun building their own windmill. They needed it to grind grain for their cloister and their hospital. And so, gentle listener, that is how high technology finally did come to Canterbury in the year of our Lord 1200. 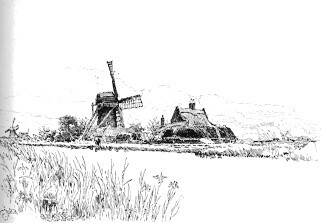 Kealey, E., Harvesting the Air: Windmill Pioneers in Twelfth Century England . Berkeley: University of California Press, 1987, Chapter 7. From the October, 1895, Century Magazine.